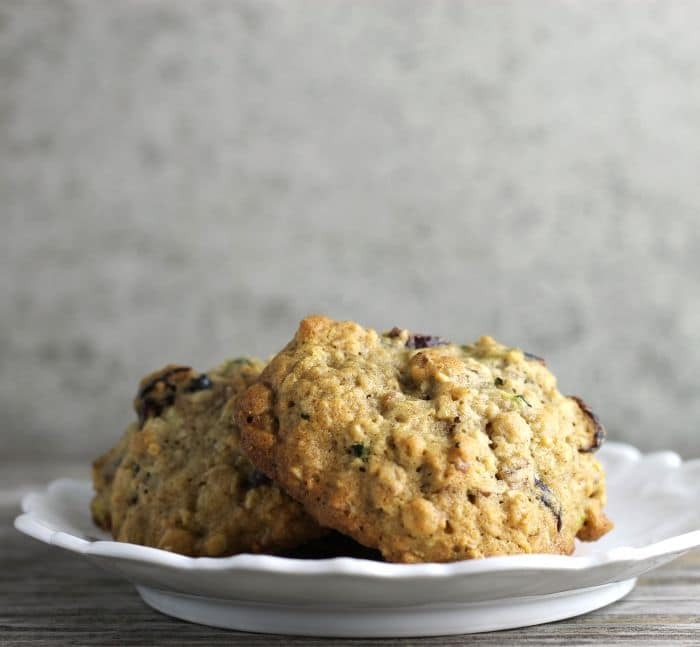 Zucchini cranberry oatmeal cookies are perfect for a quick breakfast on the run or for an afternoon snack. These cookies have so many yummy things packed into them that I am sure that you will fall in love with them just as I have. I am excited to share this recipe with you guys today. Oatmeal cookies have always been some of my favorite cookies to eat. 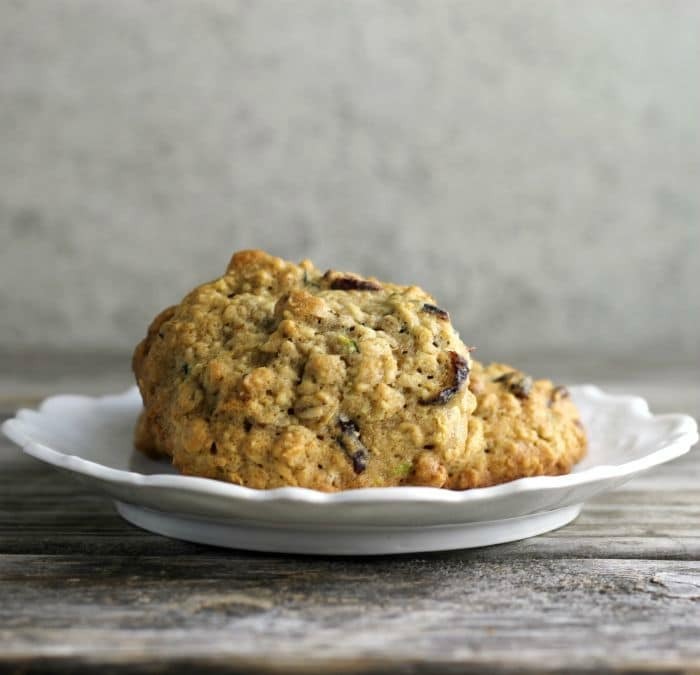 I remember when growing up my mom made some of the most delicious oatmeal raisin cookies you would ever want to eat. So let me tell you how these came about besides the fact that I love oatmeal cookies. Mike and I were driving somewhere in the car when we were listening to a cooking show on the radio. (Of all places to listen to a cooking show). The host on the radio show was talking about zucchini and all the things that you can make with zucchini. One of the things that they mentioned was putting zucchini in cookies which I have done before, but it has been such a long time ago I had forgotten all about it. I had also noticed that at one of our local stores had a sale on dried cranberries. So that is when the idea of these cookies came into play. I made these cookies again last week for a baby shower for my daughter-in-law. I had someone mentioned that they don’t care for zucchini, but that they really enjoyed the cookies. There you have it even those who don’t like zucchini like these cookies. 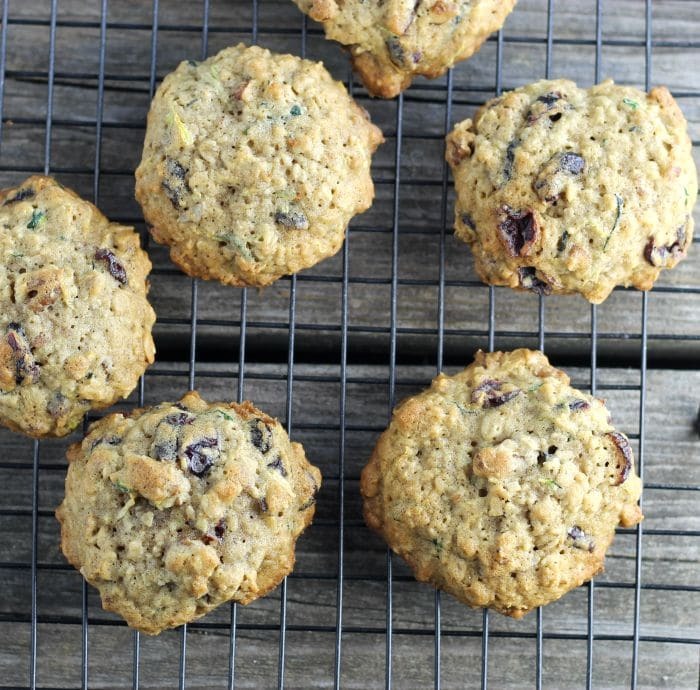 Do you like zucchini in cookies? Or maybe you have not eaten these types of cookies, either way, I hope you give these cookies a whirl. 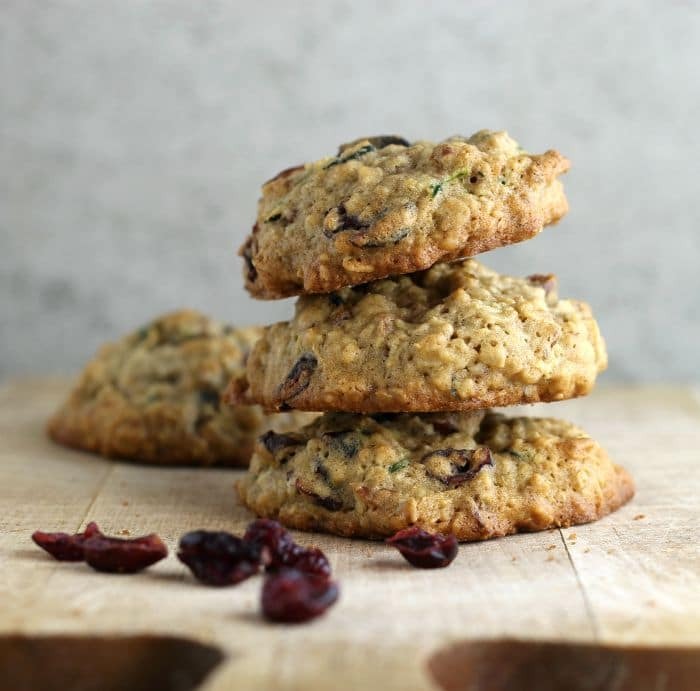 You may fall in love with these zucchini cranberry cookies like I have. Preheat oven to 350 degrees F. Prepare baking pan. Cream together the butter, sugar, and brown sugar with an electric mixer. Add eggs one at a time and mix in. Sift together the flour, old fashion oats, baking soda, cinnamon, and salt add to the creamed mixture and mix in. Mix in the zucchini, pecans, and dried cranberries until well blended. Scoop with a teaspoon. Make the scoops well rounded. Place on prepared cookie sheets and place in the preheated oven. Bake 12 to 14 minutes or until they are lightly browned. Remove from the oven and cool on cooling racks until completely cooled. These cookies freeze well. Make sure to squeeze as much liquid as you can from the shredded zucchini before adding it to the cookie dough. What a wonderful way to enjoy this summer squash! They look healthy and delicious and would make a fabulous breakfast on the go too. I like zucchini in just about anything! These look great and i love the cranberries in there.